A few days ago I had a little meltdown at one of our local Michaels Stores. We were there to shop for a new tart warmer and to check out their Halloween stuff. The 40% off 1 regular priced item coupon we had in our possession was about to expire. Off we went. We browsed for about a half hour. It was a nice break from my typical routine. Relaxing. Often times, with the amount of writing I do (2 blogs and a book), I need a change of scenery. A simple trip to the grocery store or to pick out a tart warmer is sufficient. While waiting in the large checkout area, we spotted a display of plush dogs and cats. At the top were a few that could have been Lobo's twin. Lisa grabbed one. Her face lit up. She was excited. And, for a moment, so was I. This plush pom was coming home with us. Out of the blue, the proverbial hand of reason smacked me upside the head. I grabbed the plush toy from her hand. "Wait! Oh no. We're not getting this for Lobo. SEEE. This plush has FOUR legs. Our son only has THREE. I am NOT going to give this to Lobo and have him think he's flawed. He's not flawed. Not all pups have four legs. Or three. Some just have two. Some pups have no eyes. And while I COULD do the unthinkable and alter this plush dog to look more-like-Lobo, I just can't as it teeters on morbid. And, I would cry. 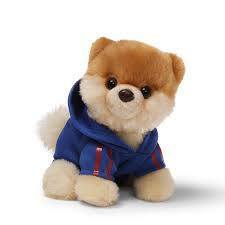 You would think by NOW they would make plush toys to represent all pups...not just pups with four legs and eyes." By this time, I was holding the plush toy in the air, shaking it. The look of on Lisa's face was priceless. Everyone was looking at us. While she could have unwrapped a Hershey bar and force fed me claiming low sugar or PMS, she instead grabbed the plush toy, held it up and said, quite loudly, "Yeah! Not all dogs have four legs! We're proud to have a 3-legged son!" She put the plush dog back in its rightful place. Within a few seconds, people went back to whatever it was they were doing. A few shook their heads and rolled their eyes. When it was our turn to be waited on, our cashier never asked, "How are you today?" And, she never made eye contact with either one of us.